What would it be like, I wondered, to cook for eighty hungry people, particularly for someone like me who is used to cooking for one. So I decided to try it and last Saturday I joined forces with the seasoned crew at Holy Trinity Church in the Yorkville neighborhood of Manhattan, who prepare a supper every week for anyone who is in need of a warm, nourishing meal. Usually between eighty and a hundred people show up and the kitchen crew has to be ready to serve by 5:15 with the tables nicely set. The schedule is tight because the premises are given over to the Trinity Thrift Shop that same day and there are stacks and hangers full of secondhand clothing spread out all over the ample basement with last minute purchases being toted up. Then suddenly it’s time to clean up the clutter and transform the space into an orderly dining hall before the doors open and the hungry, lined up outside, descend. But this moment of tension only lends to the drama. And that’s always part of the fun when you are giving a dinner party. Suddenly as we are finishing up, about a dozen teenagers descend the basement stairs and are introduced by our pastor as new helpers. It seems that they are from a Staten Island high school and that they wanted to do something helpful so they Googled soup kitchens and read about Holy Trinity’s program. They immediately throw themselves into the work, quickly clearing out the dining room, arranging the long tables, covering them in sheets of white paper to simulate linen table cloths, and setting places with real cutlery—no plastic knives and forks for the HTC guests. As I look around the busy kitchen, I realize that the unassuming Bob Noorsesion, whom I’ve just met, is secretly the maitre de cuisine here, as though he had been born to the task. He doesn’t give orders; he just performs, gracefully and efficiently. It’s as though he had a timer in the back of his head, and we fall into step, taking up the choreography as we fill big baking trays with commercially prepared breaded chicken breasts, which he pops into the hot oven and automatically clocks. At the same time he tends to the frozen vegetable mix that goes into one of the huge pots of boiling water on the large restaurant stove and to the pasta which he shovels into another pot. When his automatic clock goes off, he hoists the pot (which I couldn’t have lifted without a crane) from stove to sink and drains the chunks of pasta, then tends to the veggies. At last a cook’s task falls to me when the bowl of steaming pasta is put on the table. I get to toss it with butter and season it with salt and pepper until the balance is right. Fortunately as part of our bread service, we had peeled the foil wrappers from masses of those little pats of butter that restaurants serve so there is a huge pile of butter pats waiting to be tossed in and absorbed (Julia would have approved of that!). Anyway, the night that I am here, there is plenty to eat and second helpings to go around. Of course, there are a few complaints from some about what they can and can’t eat but there is a good feeling all around and, as I pour coffee at the tables, I feel the warmth and the appreciation. These people are our guests and they are glad to be at our table. There is even one table made up only of women, who seem to come regularly less out of a need for food than for the company. A part of me wishes that we had really cooked the food we are offering. But then I thought of what that would entail: probably forty pounds of meat to make enough for a beef stew that would satisfy these appetites, to say nothing of all the prep work and careful tending involved in cooking up a really good boeuf bourguignon. We’d have to chop up enough onions to rival the pile that Meryl Streep produces in Julie and Julia. And think of all the big skillets needed for braising the onions and mushrooms separately to get a good glaze. No, I am enough of a realist to reluctantly bury that fantasy. But I do learn that by early summer the HTC kitchen gets fresh vegetables from the Community Supported Agriculture group that supplies garden produce as it comes into season. So I’ll be back to peel the carrots and wash the greens. There’s nothing like having a dog around when you’re cooking. He (or she) is always there to catch whatever morsels you may drop, to show his appreciation with a lick of the tongue, and to relieve you of the job of scraping and rinsing all the dishes before they go into the dishwasher. That pre-rinse is particularly appreciated when you’ve given a dinner party and had to play chef and chief bottle-washer, to say nothing of hostess, all at the same time. It’s more than a year now since my Corgle (short for Corgi-Beagle) Prince Madoc died of old age and I still miss him every time I come home. As I headed for the kitchen he would be several steps ahead of me. If I put down a plate that had a mishmash of leavings (never my plate! 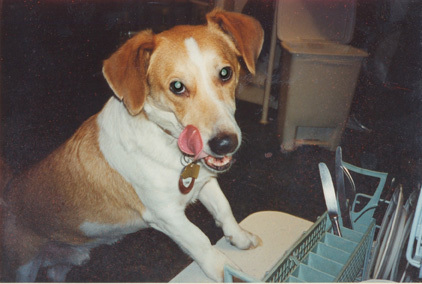 ), he would always maneuver his long tongue around it to separate the meat scraps and juices from the veggies. When he’d consumed the good stuff, he would look up longingly, hoping there was just a little more to come. Then he would return to the plate for a final lick after I’d put it in the dishwasher just to make sure he hadn’t missed anything. I would often speak French to him because it was a good way to practice my langue de cuisine. I liked the fact that he never talked back, correcting my accent and grammar. And I could tell that he loved the expressive lilt of spoken French. Some months after Madoc was gone, I tried to get a small dog from a rescue shelter in Long Island and I foolishly picked a very forlorn little creature, naming him Precious as I snuggled him in my arms and took him home. But I should have been suspicious when I gave him his first bowl of food and he hardly touched it. It developed that he had been so abused that he couldn’t trust human beings, and in the ensuing days, though he gingerly ate a little more, nothing really worked, neither love nor good food, and I had to face the painful lesson that he was as unhappy as I was. So Precious had to be returned. Now I am looking again and I’m a little wiser. I realize that the refusal to eat is a profound sign of distress in a dog. Moreover, it’s a handicap to humane training methods because how can you use a treat to give a command or reward a fellow when the lure isn’t tempting? I’ve often wished I could take a dog to Paris with me. I love the way the French treat their dogs, taking them everywhere, letting them run free in the parks and treating them to lunch at a neighborhood bistro, where the chef is likely to send out a little bowl of something delicious pour le chien settled under the table. I am told that the French are considerably less indulgent these days than they used to be, but they are still more civilized than we are. You can see it in a dog’s cocky stride as he accompanies his family shopping in the busy outdoor markets of Paris. When I was about nine years old, my parents agreed to let me have my first dog. I had been begging for one and they finally gave in when they thought I was old enough to take care of the creature myself. That meant not just walking her but cooking for her because in those pre-World War II days canned and dried dog foods couldn’t be found in your local grocery. So when we brought a Scotty named Sally MacGregor back from Vermont, she settled happily into New York life—primarily, I liked to think, because she loved my cooking. I certainly loved cooking for MacGregor. It was my first experience alone at the stove and I could do what I wanted, cooking up chopped meat with whatever leftover tidbits I could find. She particularly loved liver and bacon (perhaps that’s where I got my early start appreciating organ meats). It was a turning point and from then on Jeffrey dedicated himself to preparing such delicious and healthful dinners as Roasted Marrow Bones for his canine friend. He talked with French chefs and, of course, got a positive response (and more recipes), but most of the vets and dog food company spokesmen he consulted worried that Sky would not be getting a “complete and balanced” diet. But Sky is doing well and Jeffrey is doing well and I think I will join them in practicing what’s-good-for-me-must-be-good-for-my-dog as soon as I find the perfect hungry creature, just little enough so I can tuck him or her under the seat when we fly off to Paris.